Candy ( bagged & in original wrapping) UDPATE 2017: Candy no longer allowed. NOTE: Different countries have different restrictions on what can be packed in an OCC shoebox due to customs, for instance some can't send candy or homemade stuffed animals. Be sure to check the guidelines from your national organization before packing! First the letter and plain pad of paper went in. Then the coloring pad (more info on making them here) and board book flat on the bottom and the rocking toy tucked in a corner. Then came the crayons in their case and the lined paper, pencils, sharpener, eraser, etc. went in the pencil case. Then came the ball, shirt tucked in one flipflop, socks & blanket (info on making those here) in the other. In the middle was the skirt that is tightly rolled and rubber-banded to keep it tight. Finally came they new, stuffed "friends"
It closes! The rubber bands hold it tight. We often pack themed boxes. 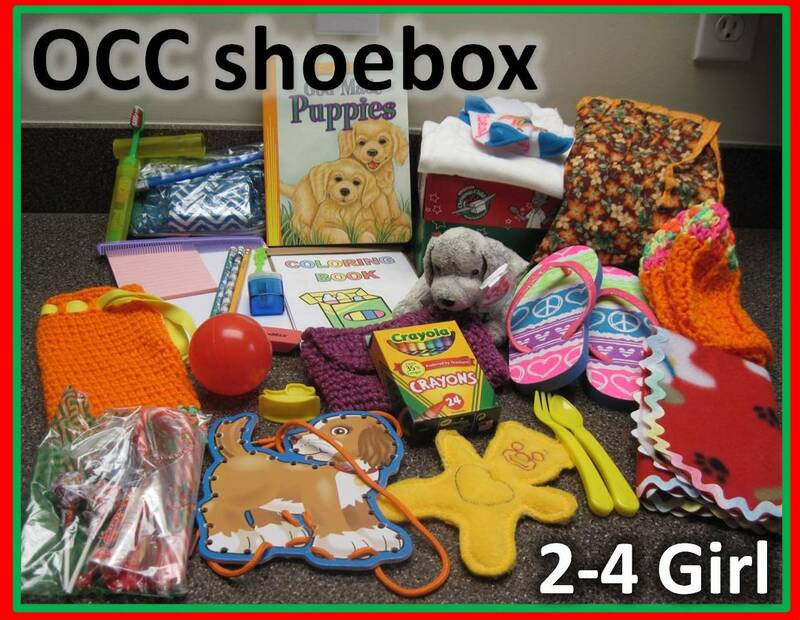 If you are interested in seeing some of those you can find the posts in this link: Themed Operation Christmas Child Shoeboxes. I saw on one post you have an excel spreadsheet for inventory, could you please do s post on it? It would be so helpful to see an example of how to keep up with what I am buying! We are in the process of updating how we do that-I'll try to post it soon!